London is home to some of the greatest restaurants in the world. From fine-dining up in the sky to small eateries tucked down back alleys, the city is a foodie haven. When you are in London, you won’t want to miss the chance to enjoy the best food in town. Here we recommend a list of best restaurants in London based on their quality of food, services, locations and settings. At Belgravia Chauffeurs, we will help you secure a table at one of these fine-dining restaurants for every Mercedes S-Class return booking. Why not travel in style and enjoy the best food in town? Our private chauffeured service will not only help you get to your destinations in the fastest way, but will also assure you the best London experience. Situated on Park Lane in London, this infamous kitchen is run by executive chef Jean-Philippe Blondet. Food is to a Michelin-star level, and the restaurant champions seasonal produce from British and French suppliers with modern and refined dishes. The set lunch menu changes each week, while the fine dining menus are introduced each season. 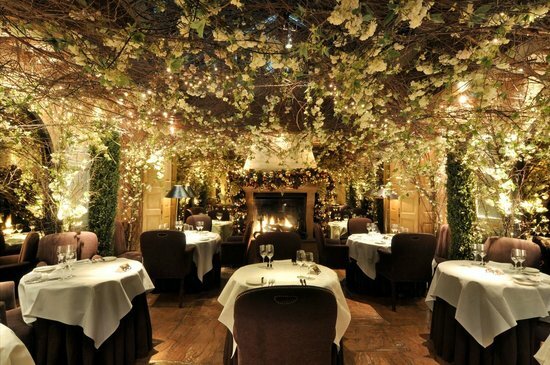 Renowned for its contemporary French cuisine, it has also won awards for being London’s most romantic restaurant. The perfect location for a date night or engagement proposal, it is also ideal for wine lovers, with its wine list classed as one of the finest in the world. 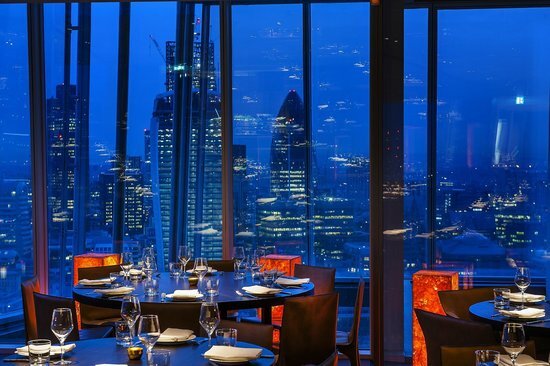 Set within the infamous 87-storey skyscraper, Oblix is as popular for its food as it is for its panoramic views of London. With a glittering skyline at night and prime time sunset watching moments, Oblix offers international cuisine from the 32nd floor. It has a very urban New York feel to it, combined with a unique, almost Balinese temple-feel upon entering. Sophisticated and dramatic, the kitchen is open and theatrical with a great cocktail library for drinks lovers at the bar. 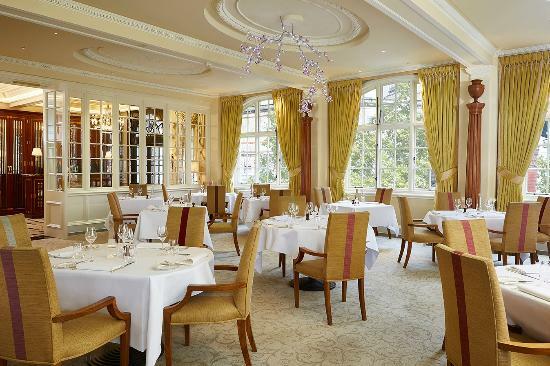 This plush dining room in the family-owned hotel in St. James’s Park is opulent and luxurious. With dripping Swarovski chandeliers, thick carpets and drapes, and decadent decor, the 103-year-old Michelin-star restaurant is sophisticated and indulgent. The food offers a fresh take on British classics. It’s also possible to book yourself an overnight stay, with our chauffeur collecting you in the morning. Situated in Mayfair, Sketch is one of the most Instagram-loved restaurants in the city thanks to its chic baby pink decor and egg-pod toilets. One for the culturally sophisticated, it is a gastro-brasserie restaurant with both delicious food and creative artwork. The Gallery has been transformed by British artist David Shrigley. Sketch is one of many restaurants featuring in a long-term programme of restaurants conceived by artists. This Michelin-star restaurant has broken boundaries thanks to founder Alan Yau’s refreshing interpretation of Cantonese food, combined with the height of fine dining. Despite Alan no longer working with the brand, his legacy lives on with internationally recognised food that puts authentic Chinese food on the map for the depths and breadths it can cover. Situated in Mayfair, it is a beacon for unique fine dining. Ranked twelfth out of 18,113 restaurants in London by TripAdvisor, this jewel in Notting Hill has a wealth of glowing reviews, ranking highly for service, food, value and atmosphere. 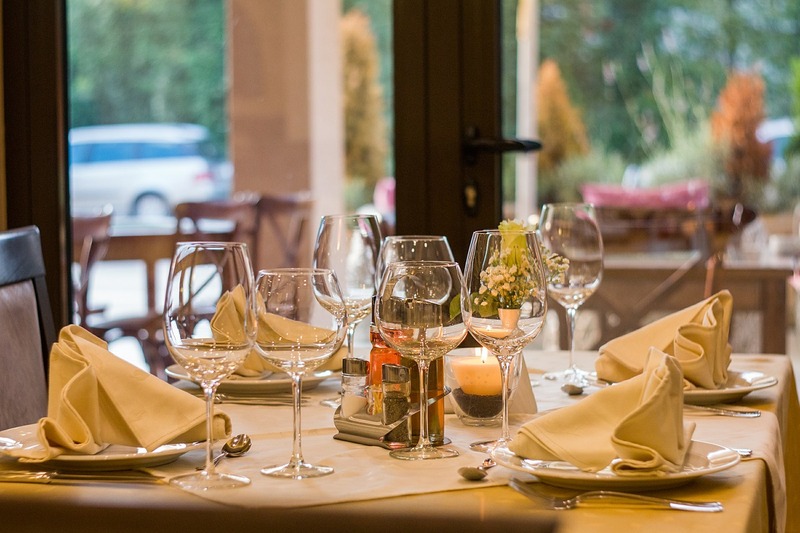 Small and intimate, it offers a set price menu, delicious cooking and presentation, and charming staff who will wine you and dine you until your evening is over, making the whole time feel special. If you’re not sure what wine to go for, they’ll be able to guide you on the perfect pairings. Wherever you choose to spend an exquisite evening of fine dining, allow Belgravia Chauffeurs to take you there in style and comfort. Contact us today to start planning a truly sophisticated night, whatever your tastes.